bioBakery workflows is a collection of workflows and tasks for executing common microbial community analyses using standardized, validated tools and parameters. Quality control and statistical summary reports are automatically generated for most data types, which include 16S amplicons, metagenomes, and metatranscriptomes. Workflows are run directly from the command line and tasks can be imported to create your own custom workflows. The workflows and tasks are built with AnADAMA2 which allows for parallel task execution locally and in a grid compute environment. See individual workflows and tasks for additional software requirements. bioBakery workflows can be installed with Homebrew, Docker, or pip. This will install almost all of the dependencies for all workflows (ie Kneaddata, MetaPhlan2, etc.) excluding those dependencies that have licenses. See the bioBakery Homebrew user manual for instructions on manually installing additional dependencies. The image will include all dependencies for all workflows (ie Kneaddata, MetaPhlan2, etc.) excluding those dependencies that have licenses. This will only install the core software and dependencies. It will not install the dependencies for the workflows (ie KneadData, MetaPhlan2, etc.). Once the software and dependencies are installed, the databases can be installed automatically. Replace $WORKFLOW with the workflow name (ie wmgx, 16s, wmgx_wmtx, or wmgx_demo). The databases will be installed at $HOME/biobakery_workflow_databases/ or /opt/biobakery_workflow_databases/ depending on permissions. To install to a custom location add the option --location $FOLDER. With this option you will also need to set the environment variable $BIOBAKERY_WORKFLOWS_DATABASES to the folder so the workflows can find the installed databases. The database install requires some of the dependencies from the corresponding workflow to build and install the databases. For example, installing the wmgx databases requires HUMAnN2, KneadData, StrainPhlAn and bowtie2. Please install these dependencies prior to installing the databases. Depending on the method used to install the workflows you might need to install these dependencies in addition to the workflow. Alternatively the databases can be installed manually and then referenced with environment variables. The shotgun data processing workflows require Kneaddata (human, human transcriptome, and SILVA), HUMAnN2 (utility mapping, nucleotide, and protein databases), and StrainPhlAn (reference and marker) databases while the 16s data processing workflow requires the GreenGenes fasta, taxonomy, and usearch formatted files. When manually installing the databases, the following environment variables need to be set. 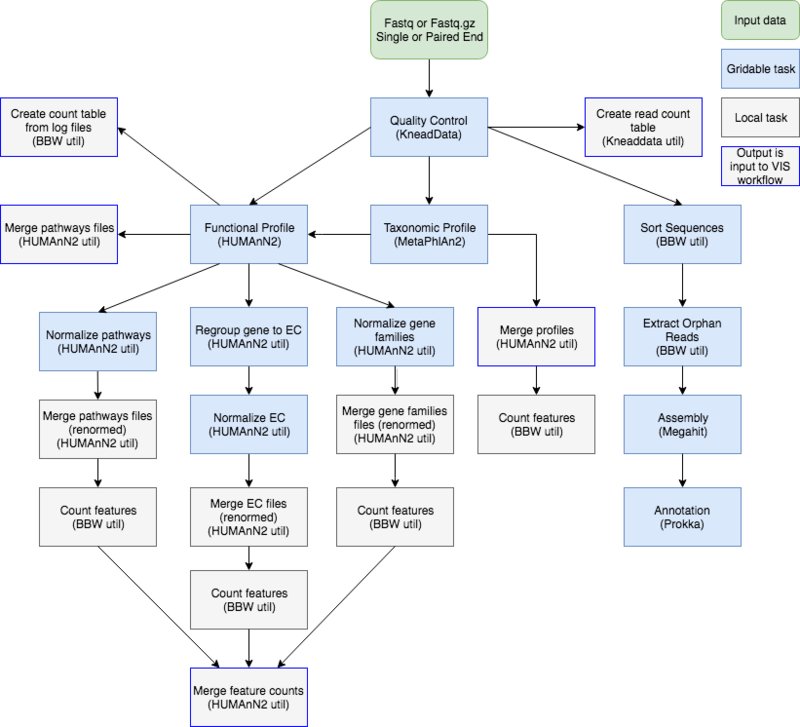 Shotgun workflows: KNEADDATA_DB_HUMAN_GENOME, KNEADDATA_DB_RIBOSOMAL_RNA, KNEADDATA_DB_HUMAN_TRANSCRIPTOME, STRAINPHLAN_DB_REFERENCE, and STRAINPHLAN_DB_MARKERS. 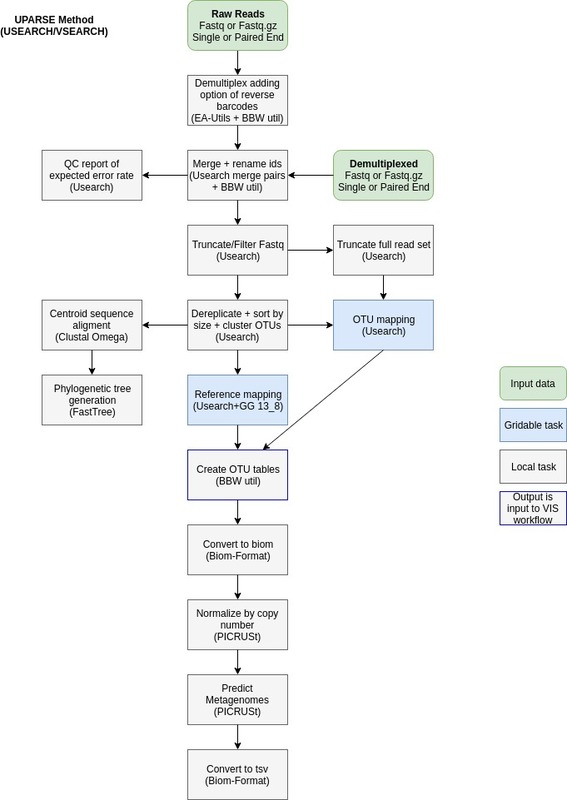 16s workflows: GREEN_GENES_USEARCH_DB, GREEN_GENES_FASTA_DB, and GREEN_GENES_TAXONOMY_DB. This command will run the workflow on the files in the input folder ($INPUT_DIR to be replaced with the path to the folder containing fastq files). It will write files to the output folder ($DATA_OUTPUT_DIR to be replaced with the folder to write output files). The input folder ($DATA_OUTPUT_DIR to be replaced with the path to the folder) in this command is the output folder from the data processing workflow. The folder ($OUTPUT_DIR to be replaced with the path to the output folder) will contain the output files from the visualization workflow. The project name should replace $PROJECT in the command so the report can include the name. --local-jobs <1> : Run multiple tasks locally in parallel. Provide the max number of tasks to run at once. The default is one task running at a time. --grid-jobs <0> : Run multiple tasks on a grid in parallel. Provide the max number of grid jobs to run at once. The default is zero tasks are submitted to a grid resulting in all tasks running locally. --grid <slurm> : Set the grid available on your machine. This will default to the grid found on the machine with options of slurm and sge. --partition <serial_requeue> : Jobs will be submitted to the partition selected. The default partition selected is based on the default grid. For additional workflow options, see the AnADAMA2 user manual. See the section on parallelization options to optimize the workflow run based on your computing resources. A set of fastq (or fastq.gz) files (single-end or paired-end). The files are expected to be named $SAMPLE.fastq.gz,$SAMPLE.R1.fastq.gz, or $SAMPLE.R2.fastq.gz where $SAMPLE is the sample name or identifier corresponding to the sequences. $SAMPLE can contain any characters except spaces or periods. The workflow will detect if paired-end files are present. By default the workflow identifies paired end reads based on file names containing ".R1" and ".R2" strings. If your paired end reads have different identifiers, use the option --pair-identifier .R1 to provide the identifier string for the first file in the set of pairs. The workflow by default expects input files with the extension "fastq.gz". If your files are not gzipped, run with the option --input-extension fastq. In the command replace $INPUT with the path to the folder containing your fastq input files and $OUTPUT with the path to the folder to write output files. The workflow runs with the default settings for all main tool subtasks. These settings will work for most data sets. However, if you need to customize your workflow settings for the KneadData and StrainPhlAn subtasks please read the documentation for each tool to determine the optimum settings. Then apply these settings by using options for each tool. For example, --qc-options="$OPTIONS" will modify the default settings when running the KneadData subtask and --strain-profiling-options="$OPTIONS" will modify the options when running the StrainPhlAn subtask (replacing the $OPTIONS in each with your selected settings). Add the option --run-assembly to add the tasks to run assembly. Demo input files can be found in the biobakery_workflow source examples folder. Two sets of fastq (or fastq.gz) files (single-end or paired-end). One set is of whole metagenome shotgun data and the other is whole metatranscriptome shotgun data. The files are expected to be named $SAMPLE.fastq.gz,$SAMPLE.R1.fastq.gz, or $SAMPLE.R2.fastq.gz where $SAMPLE is the sample name or identifier corresponding to the sequences. $SAMPLE can contain any characters except spaces or periods. Optionally, provide a mapping file. This file will have two columns and be tab delimited. The first column is the sample names for the metatranscriptomes and the second is the corresponding metagenome sample. See the demo mapping file for an example. In the command replace $INPUT_WMS with the path to the folder containing your whole metagenome shotgun fastq.gz input files, $INPUT_WTS with the path to the folder containing your whole metatranscriptome shotgun fastq.gz input files, and $OUTPUT with the path to the folder to write output files. Replace $INPUT_MAPPING with your file of mapping between the metagenome and metatranscriptome samples. The workflow runs with the default settings for all main tool subtasks. These settings will work for most data sets. However, if you need to customize your workflow settings for the KneadData subtasks please read the documentation for KneadData to determine the optimum settings. Then apply these settings by using the option --qc-options="$OPTIONS". 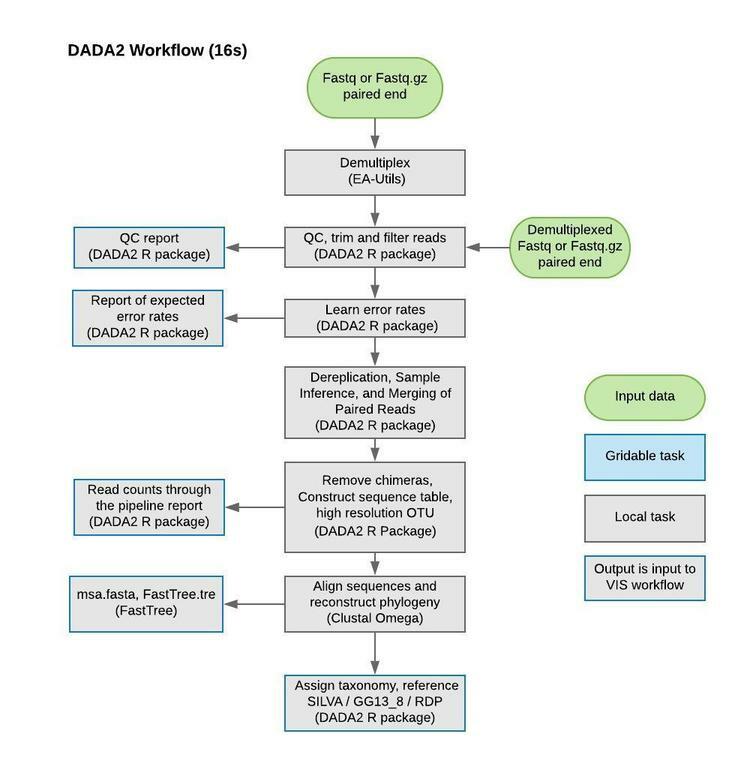 The 16s workflow has two methods that can be used: UPARSE (with either USEARCH or VSEARCH (default)) and DADA2. All methods perform quality control and generate taxonomic tables. A set of fastq (or fastq.gz) files (single-end or paired-end; only pair-end for DADA2) raw or demultiplexed. If the files are demultiplexed, the files are expected to be named $SAMPLE.fastq.gz,$SAMPLE_R1_001.fastq.gz, or $SAMPLE_R2_001.fastq.gz where $SAMPLE is the sample name or identifier corresponding to the sequences. $SAMPLE can contain any characters except spaces or periods. A barcode file (only required for raw reads). The workflow will detect if paired-end files are present. By default the workflow identifies paired end reads based on file names containing "_R1_001" and "_R2_001" strings. If your paired end reads have different identifiers, use the option --pair-identifier .R1. to provide the identifier string for the first file in the set of pairs. By default the workflow implements the UPARSE workflow using VSEARCH plus additional tasks. To run with USEARCH as the executable add the option --method dada2. The workflow runs with default settings for the subtasks. Depending on the lengths of your reads you might want to change the setting --trunc-len-max 200, if running the VSEARCH/USEARCH method, to a smaller value. Reading through the maxee table will help to determine the length to use for trimming based on the joined reads and their quality scores. For other default settings, please run the workflow with the --help option. All of the other settings will work for most data sets. If there are any you would like to change, please review the usearch documentation to determine the optimal settings. Add the option --method dada2 to run the DADA2 method instead of VSEARCH. This workflow generates a document of tables, bar plots, a PCoA plot, scatter plots, and heatmaps using the output of the wmgx workflow as input. An input folder containing the final products from the wmgx data workflow. A file of the KneadData read counts for the wmgx samples (single or paired end). A file of the merged taxonomic profile. A file of the merged pathway abundances (normalized). A file of the HUMAnN2 alignment counts. A file of the HUMAnN2 feature counts. The log file from the corresponding data processing workflow. The report format (Options: pdf/html, pdf is default). A pdf (or html) report. A directory of figures included in the report. In the command replace $INPUT with the output folder created by running the wmgx data processing workflow, $PROJECT with the name of the project, and $OUTPUT with the path to the folder to write output files. This workflow generates a document of tables, bar plots, a PCoA plot, and heatmaps using the output of the wmgx_wmtx workflow as input. Please note this workflow is currently only for paired end reads. An input folder containing the final products from the wmgx_wmtx data workflow. A file of the KneadData read counts for the wmgx samples (paired end). A file of the KneadData read counts for the wmtx samples (paired end). A file of the merged taxonomic profile for the wmgx samples. A file of the merged pathway abundances for the wmgx samples (normalized). A file of the HUMAnN2 alignment counts for the wmgx samples (Optional). A file of the HUMAnN2 feature counts for the wmgx samples (Optional). A file of the HUMAnN2 alignment counts for the wmtx samples (Optional). A file of the HUMAnN2 feature counts for the wmtx samples (Optional). A file of the gene families RNA/DNA normalized (Optional). A file of the ECs RNA/DNA normalized (Optional). A file of the pathway abundances RNA/DNA normalized (Optional). In the command replace $INPUT with the output folder created by running the wmgx_wmtx data processing workflow, $PROJECT with the name of the project, and $OUTPUT with the path to the folder to write output files. This workflow generates a document of bar plots and a PCoA plot using the output of the 16S workflow as input. An input folder containing the final products from the 16s data workflow. A file of the closed reference OTU table. A file of the read counts per sample (including total reads, classified, and unclassified). A file of the eestats for all samples. In the command replace $INPUT with the output folder created by running the 16s data processing workflow, $PROJECT with the name of the project, and $OUTPUT with the path to the folder to write output files.